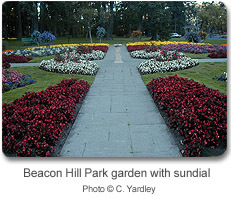 Beacon Hill Park is located along the south shore of Victoria, British Columbia and the Juan de Fuca Strait. It has been a park belonging to the city of Victoria since 1882. A trust was then established for the 62-acre (24.8-hectare) site. Beacon Hill Park was originally called Meeacan (the Salish name for belly) by the First Nations people because from a distance, it looked like the belly of a large man lying on his back. In 1956, Chief Mungo Martin and carvers David Martin and Henry Hunt created the world's largest totem pole (160 feet) from cedar. The pole was raised during ceremony with thousands of people, including First Nations' leaders and civic and provincial leaders.